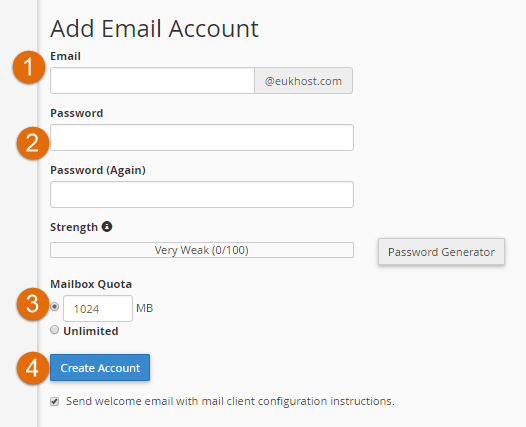 This article explains how to create a new mailbox using cPanel. Replace ‘yourwebsite’ with your domain. Email: this will be the address you would like to set up for example [email protected]. If you have multiple domains you will be able to select them from the drop down on the right hand side. Password: Enter a strong password or use the Password Generator that cPanel provide (recommended). Mailbox Quota: This is the amount of space in MB that you would like the mailbox to have available. Note: 1024MB is equal to 1GB, however there are plenty of MB to GB calculators online.